Other 2 stars chefs. More French chefs here. More Japanese chefs here. 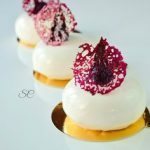 Kei Kobayashi’s style: shaking the codes; provoking a unique culinary experience whilst respecting the standards of French Gastronomy. 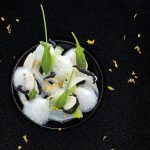 Kei has the gift of producing novelty without falling into the anecdotal, Alain Ducasse described him. 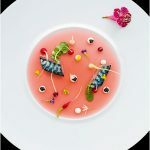 Obsessed by the quality of his products, Kei Kobayashi seeks the perfect balance between structure, savours, and harmony of colours and delicacy of dressing in order for the French Gastronomy to travel. A successful twinning of France and Japan combining sensibilities, without losing its nature. This is the living proof that, when not cheating, the cuisine does not have borders and speaks the same language: the good and the beautiful. Kei Kobayashi was born in Nagano (Japan) on 29th August 1977 in a family of cooks. 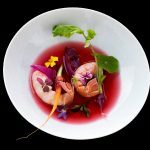 At the age of 15, he had a revelation while watching a TV documentary about Alain Chapel, the famous Three Michelin Star French Chef. The elegancy of his outfit – white jacket and black pants – seduced him. He will be a chef…. to wear the same one, and to do French gastronomy! 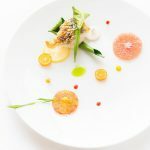 His apprenticeship in several French restaurants in Nagano and Tokyo allowed him to become familiar with French products and the basics of French cuisine (cuttings, cooking, sauces…). In December 1998, Kei arrived in Paris before heading out to discover French terroirs. He joined several Michelin-starred teams: Gilles Goujon (3 Michelin Stars) at the Auberge du Vieux Puits (Fontjoncouse), Serge Chenet (1 Michelin Star) at Prieuré (Villeune-les-Avignon), Michel Husser (2 Michelin Stars) at Le Cerf (Marlenheim). In 2003, he joined Alain Ducasse’s restaurant at the Plaza Athénée (Paris) exposing himself for the first time to the reality of Three Michelin Stars. First under the direction of Jean-François Piège then under Christophe Moret’s, of whom he will be a sous-chef at age 27. He left the Plaza in 2010 to realise his teenage dream: be the chef of his own restaurant. On 3rd March 2011, Restaurant Kei opened at 5 rue Coq Héron in Paris 1er. This discreet place, just around the corner from Les Halles, was the expression field of former Michelin Starred Chef Gérard Besson, for 24 years. Kei and his wife Chikako transformed the place into a zen frame with silver grey tones, sophisticated touches (chandelier and wall light of crystal Saint Louis) and deliberately refine. Supported by a very unite and cosmopolitan team he exchanges a lot with, Kei works with the best products in the respect of culinary traditions and along the rhythm of seasons. 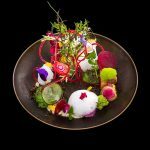 The – very spontaneous – creation of a dish is based on multiple sources of inspiration dictated by his passions: art (Picasso is one of his favourite artists), fashion, travel and nature.